Elfyn Evans is aiming to be the first Welsh driver to win Wales Rally GB. The penultimate round of the World Rally Championship (WRC) returns to Deeside from 26 to 29 October. No Welsh driver has finished inside the top three, and the last British driver to win was Richard Burns in 2000. "We will have to do everything perfectly if we want to win," said Evans who lies sixth in the overall standings with English co-driver Daniel Barritt. 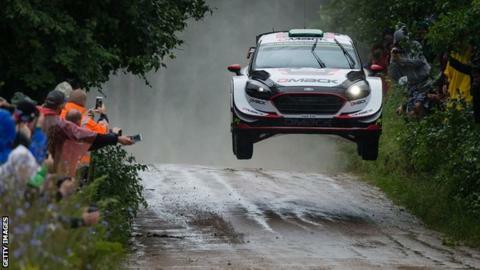 Evans, 28, has had his most successful WRC season, finishing second in Argentina and Finland. "We are definitely going to be giving it our all. There are so many things that have to go your way to win a world championship round and there is nothing guaranteed," added Evans. Evans, from Dolgellau, is confident in his DMACK/M-Sport Ford Fiesta and is not feeling the pressure ahead of his home round. "I don't tend to feel it as pressure so much to be honest," Evans told BBC Wales Sport. "The expectation myself and Dan put on ourselves on every rally is very high anyway so nothing really changes from an expectation side of things in the way we feel going into the event. "Certainly the buzz and atmosphere around the event makes it special. It is great to have the home support." Evans missed last year's event, but made a return to the top class in January 2017 after a 12-month absence. The 2012 WRC academy champion will have a lot of competition for the victory at the British round. There are his two M-Sport team-mates Sebastien Ogier and Ott Tanak as well as Hyundai driver, Thierry Neuville. All three drivers are still in contention for the 2017 WRC title. Evans can no longer win the series, but the DMACK/ M-SPORT driver has ambitions of securing his debut WRC victory on home soil this week. "That is what we are aiming for, but so are the other 12 or 13 competitors in the WRC class against us, but we will give it our best shot," he added. "We have had some strong performances at some rallies and we have had a few difficult rallies as well. "We have learnt a lot and it would be nice to get another strong result before the year is out." There have been Welsh co-drivers who have been victorious at the British round. These include Nicky Grist while he was co-driving alongside Colin McRae in the Subaru Impreza in 1997 and also with Juha Kankkunen in the Toyota Celica in 1993. Welsh co-driver Phil Mills won the UK round alongside driver Petter Solberg between 2002 and 2005.